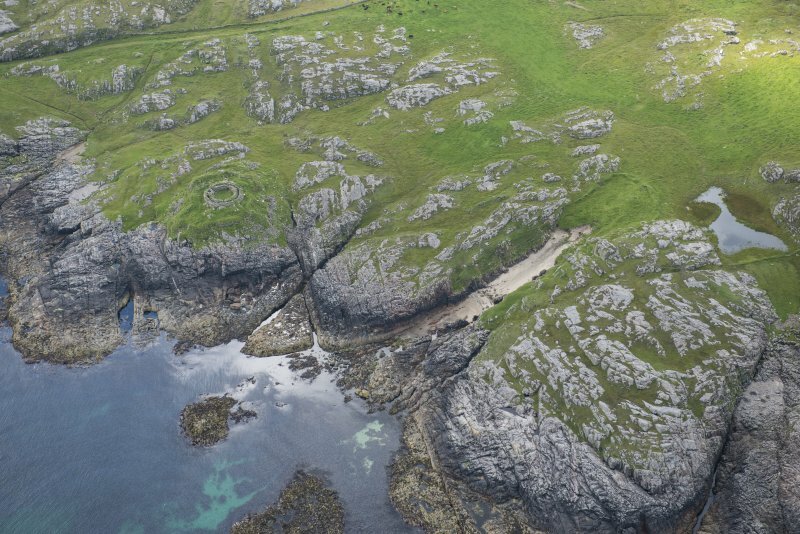 Oblique aerial view of the remains of Dun Mor Vaul broch, taken from the S.
Oblique aerial view of the remains of Dun Mor Vaul broch, taken from the SW. Interior view from NW showing entrance and door 3. Plan and section through broch. Argyll Inventory fig. 91. 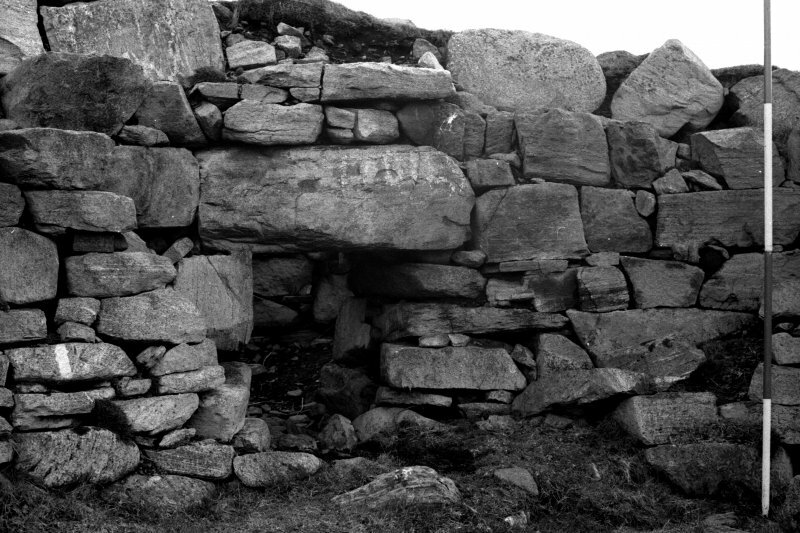 Broch, door 3, showing west side-wall. 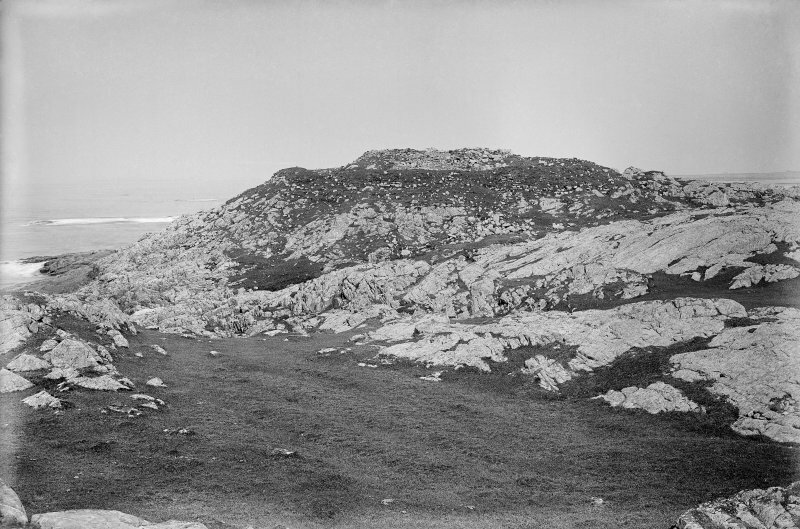 Oblique aerial view of Vaul, Dun Beag, Tiree, looking SW.
Oblique aerial view of Vaul, Dun Beag, Tiree, looking N.
Oblique aerial view of the remains of Dun Mor Vaul broch on the Island of Tiree, taken from the SE. 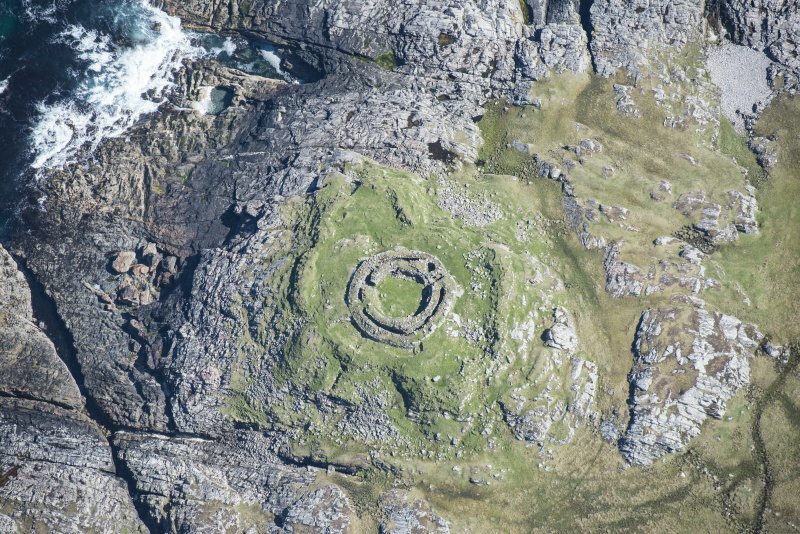 Oblique aerial view of the remains of Dun Mor Vaul broch, taken from the WSW. Mural gallery, looking towards door 3, from the NW. 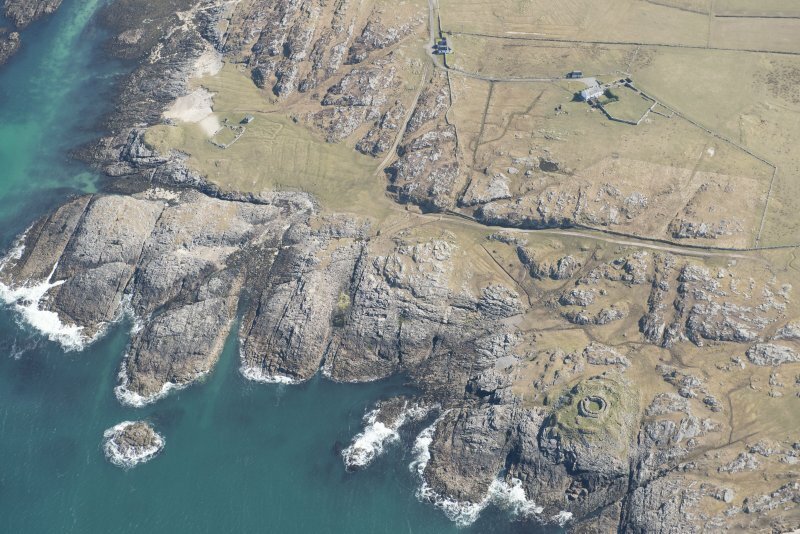 Oblique aerial view of Dun Mor, Vaul, on the Isle of Tiree, looking S.
Oblique aerial view of the remains of Dun Mor Vaul broch, taken from the SSE. 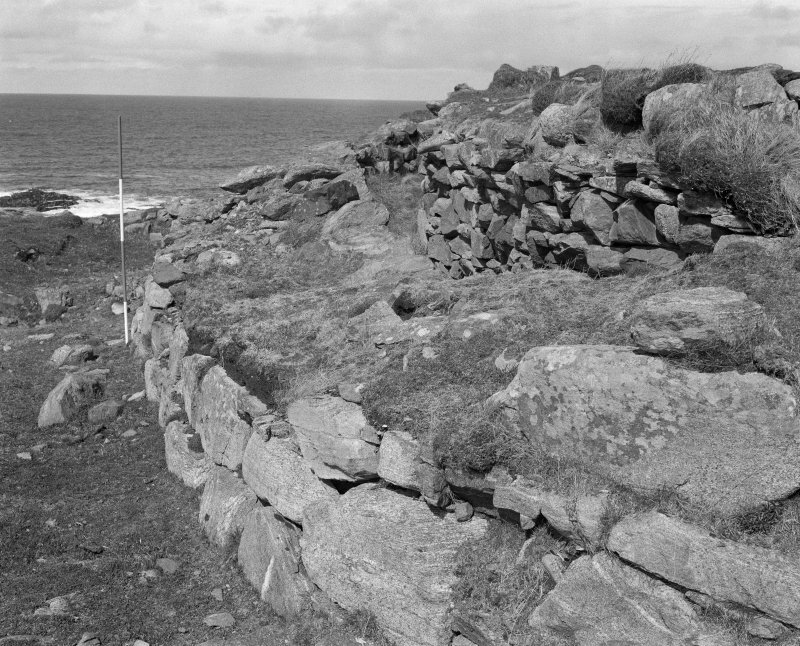 Broch entrance, NE side of passage and guard-cell, from the south-west. 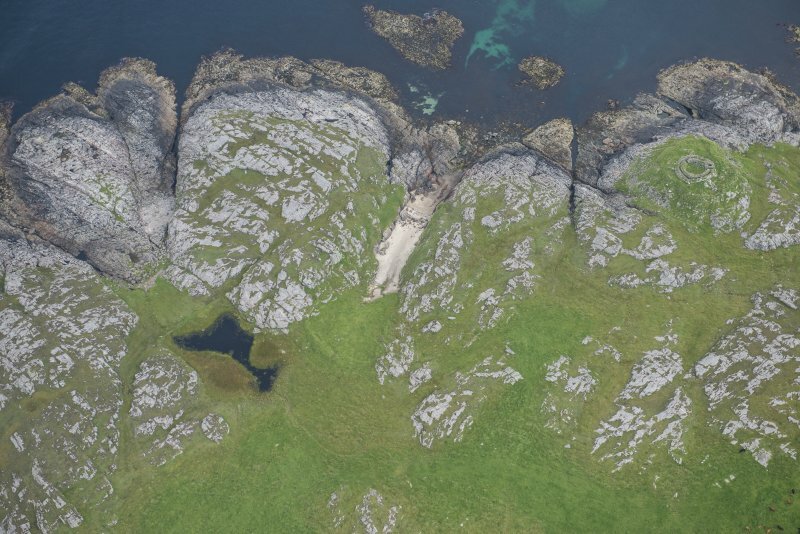 Oblique aerial view of Dun Mor, Vaul, on the Isle of Tiree, looking NNE. 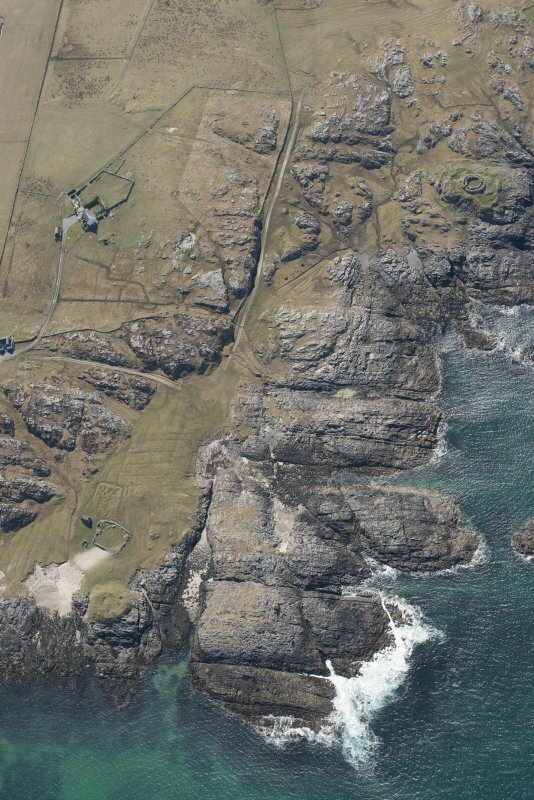 Oblique aerial view of Dun Mor, Vaul, on the Isle of Tiree, looking NE. 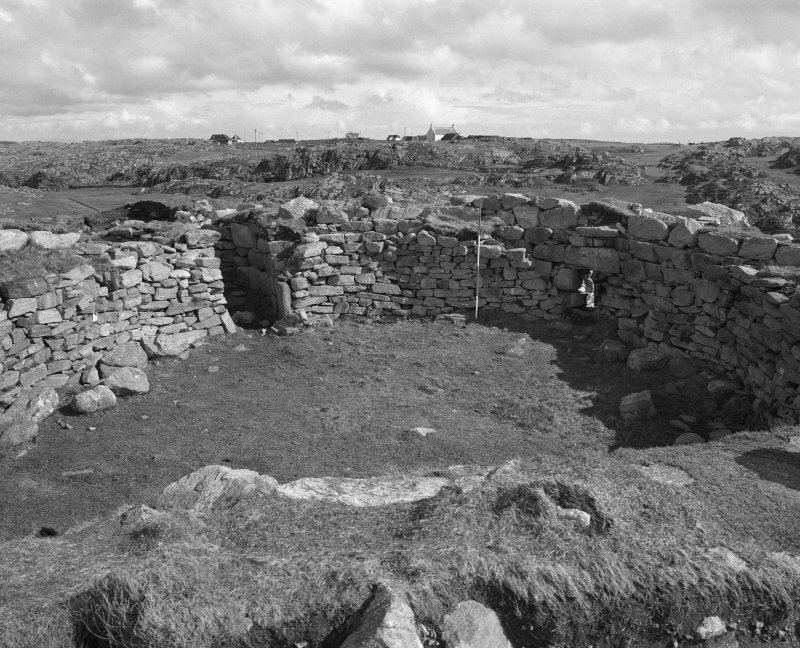 Broch interior showing doors 1 and 2, from S.
Oblique aerial view of Vaul, Dun Beag, Tiree, looking WSW. 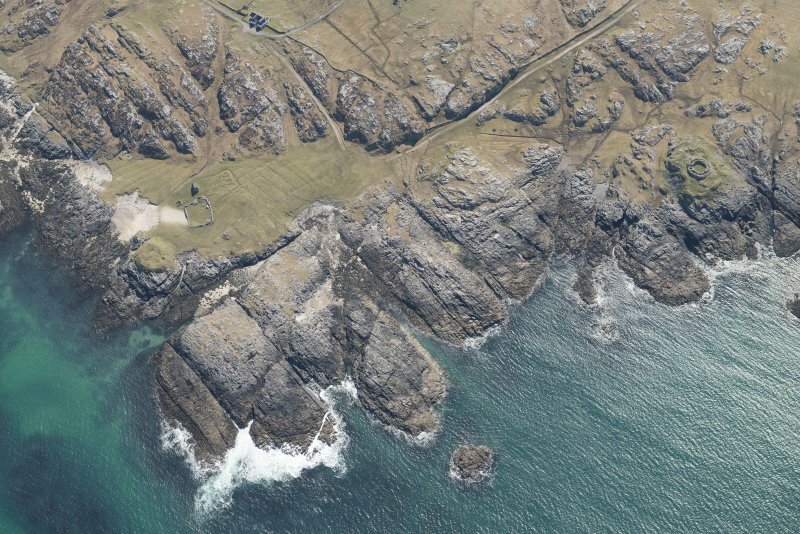 Oblique aerial view of Vaul, Dun Beag, Tiree, looking SE. Oblique aerial view of the remains of Dun Mor Vaul broch, taken from the W.
Broch, Dun Mor, Vaul: On the summit of an isolated rocky knoll, situated on the foreshore about 300m NW of the N end of Vaul township, there are the exceptionally well-preserved remains of a broch and its outworks. The knoll rises to a height of about 23m OD, but only 6m above the level of the adjacent ground on the S, or landward, side. On all sides except the N, where the knoll descends to the sea in a series of rocky shelves, the summit is protected by steep rock-studded slopes or sheer precipices up to 4.5m high. The broch was partly excavated about 1880 (E Beveridge 1903) and it was almost completely excavated in 1962-4; the following description and plan are based largely on the published report (E W MacKie 1974). 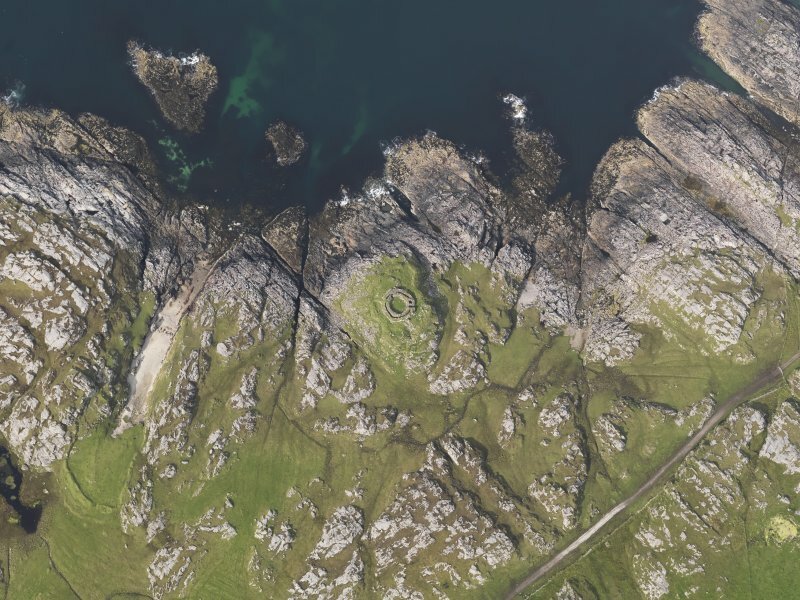 The broch occupies the highest point of the knoll, its massive wall being based on the rim of a natural rocky hollow which is bisected by a deep cleft, aligned NE and SW. In the material that filled this cleft, overlain by both the broch wall and its contemporary floor-levels, there were traces of at least two previous phases of occupation. In the earliest phase the hollow appears to have been occupied by a wooden hut, which may have eventually been destroyed by fire. This was succeeded almost immediately by a more extensive settlement, whose precise character could not be ascertained, as its surviving traces consisted mainly of midden layers, but it apparently occupied a considerably larger proportion of the summit area. 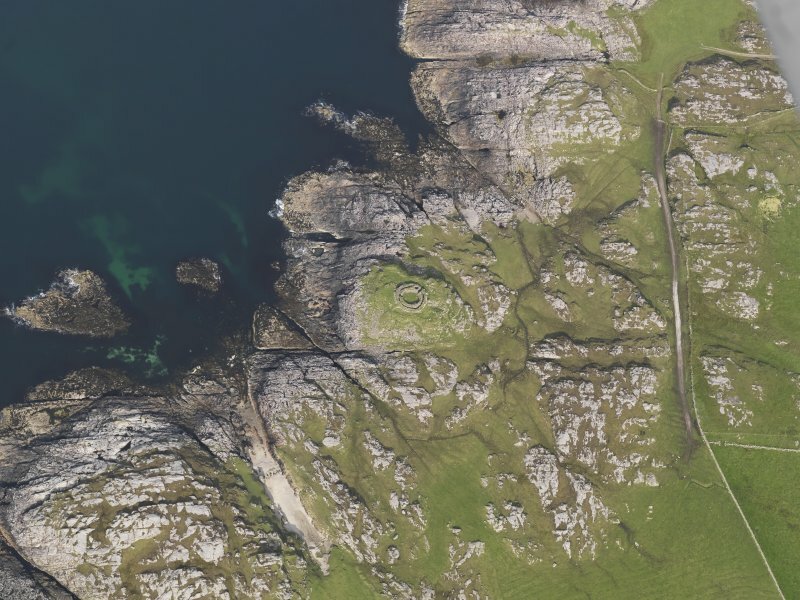 After an interval of unknown duration, possibly several centuries, the knoll was reoccupied, and shortly afterwards the construction of the broch and its outworks began. 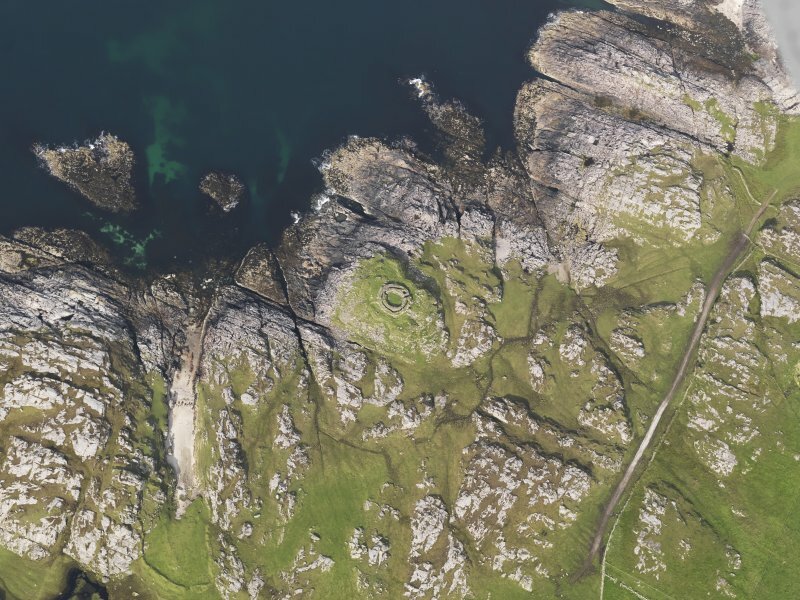 The broch measures about 9.2m in diameter within a dry-stone wall 4.5m in greatest thickness. Both wall-faces, particularly the inner, are constructed of neatly-coursed, squarish blocks and exhibit only a very slight inward batter. The outer face, in general, is more severaly denuded but on the NNE, where it rides across a narrow cleft, it survives to a height of 2.2m in eight courses. The inner face, still largely concealed by a skin of secondary walling, is better preserved and stands, on average, about 1.4m above the present level of the interior, attaining on the S a maximum height of approximately 2m. 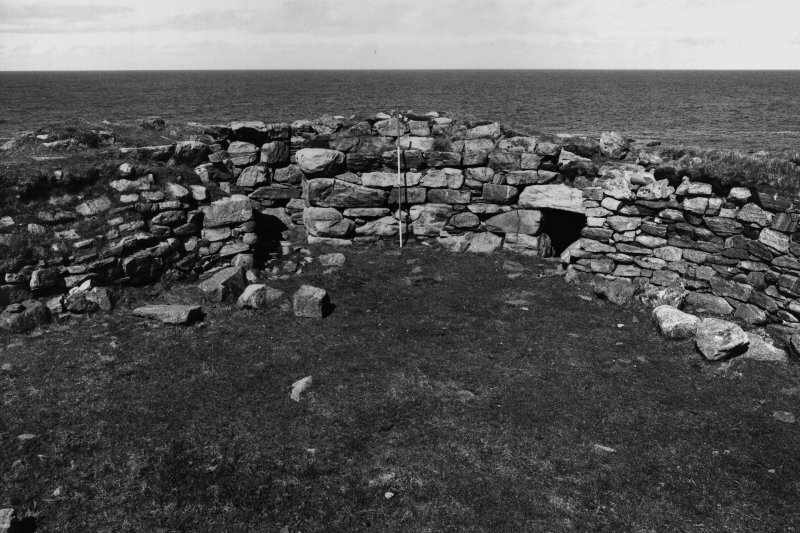 (After excavation the interior of the broch was partly back-filled and grassed over; the present floor-level thus lies some 0.4m above that of the primary phase.) At an average height of about 1.4m above the primary floor the inner face is stepped back round the entire perimeter to form a level ledge or scarcement 0.3m wide, whose purpose, doubtless, was to help to support the floor of a range of timber buildings. Within the thickness of the wall on all sides but the E, there is a g allery at ground-floor level ranging from 0.5m to 1.1m in width and from about 0.9m to 3.0m in height. The gallery is divided into two unequal portions by an intramural staircase, situated on the N, which presumably led upwards to the wall-head, either directly or by way of another gallery at first-floor level; traces of the latter can still be seen on the NE. Access to the staircase and one end of the longer portion of the gallery may be obtained through a doorway on the NNW 1.2m wide and at least 1m high; the shorter portion of the gallery may be reached through a door measuring barely 0.5m wide and only 0.7m high, and an opening of similar size leads into the southern end of the long portion. The deposit of noisome material discovered during excavation at the S end of the shorter portion was thought to indicate that this part of the feature has been used as a cesspit. The entrance, which has been rebated for a door, is situated on the ESE. With the exception of the NW quadrant, where the bare bedrock provided a sufficiently level surface, the periphery of the interior of the broch was floored with rough paving or cobbles to an average width of 1.8m. 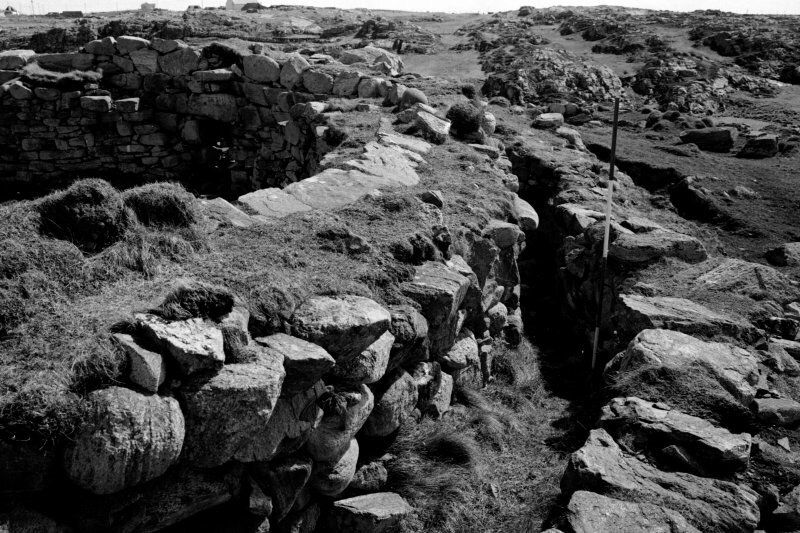 Approximately 1.3m SE of the centre lay a rectangular water-tank (E W MacKie 1974), lined with dry-stone masonry and covered with slabs. 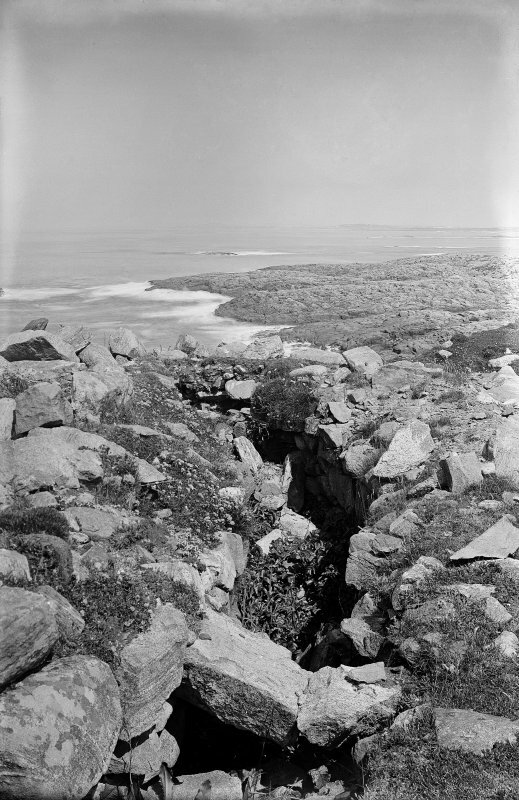 An overflow drain, of similar construction, ran SE from the tank and led out through the entrance, utilising for the latter part of its course a natural rocky cleft. In its original form the broch, whose walls were probably at least 8m high, was clearly intended to be used as a stronghold. However, among other features, the proportions of the different types of native pottery found in association with the earliest phases of the broch suggested to the excavator that at first it was not permanently occupied, but served as a temporary refuge for the local community. It was additionally protected by two outer lines of defence, one drawn round the irregular margin of the summit on all sides, and the other taking the form of a hornwork which restricted access from the landward side of the knoll. 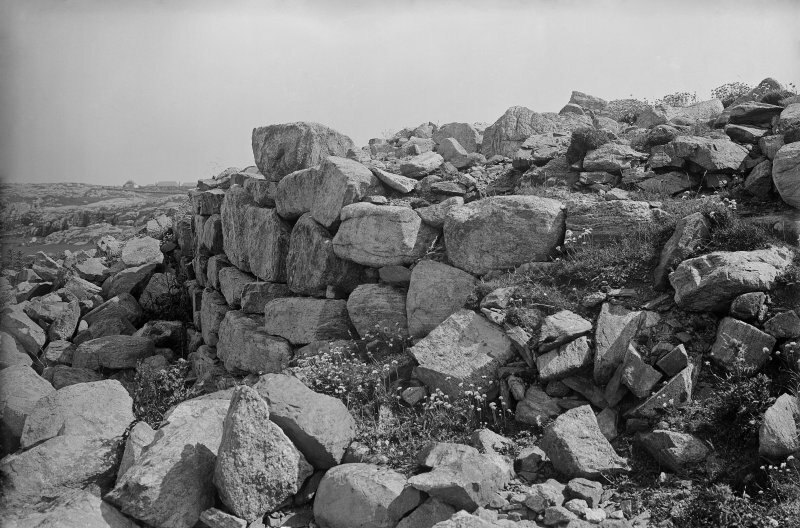 The first was a boulder-faced rubble-cored wall from 2.4m to 3.0m thick, now much reduced by collapse and stone-robbing, but surviving in some places, notably on the SE, as a grass-covered stony bank up to 1.6m high; several long stretches of outer facing-stones and a few short lengths of the inner face have been preserved in position, as shown on the plan, the most impressive sector of the former being on the N, where the wall stands 1.3m high in five courses. 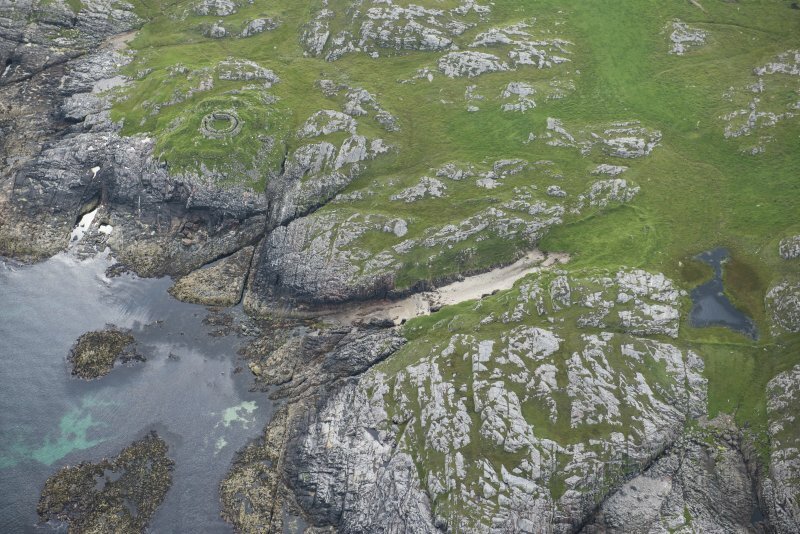 There are two possible entrances; one, lying immediately S of the broch at the head of a steep gully, has been obscured by secondary blocking; the position of the other is indicated by a curious re-entrant in the outer face NE of the broch entrance, at the top of a narrow path which climbs obliquely up the E flank of the knoll. The hornwork, an earthen rampart about 1.8m thick and revetted externally with stone, survives as a low grassy bank or scarp, nowhere more than 0.75m high, in which occasional outer facing-stones are still visible; it appears to have sprung from the outer wall to the W of the southernmost entrance and continued eastwards in an arc across the gully and along the crest of a rocky spine. The two is olated stretches of facing-stones lying between the outer wall and the E end of the spine doubtless represent a further continuation of the hornwork, although the superficial evidence suggests that in this sector it took the form of a dry-stone wall. The entrance was probably situated near the W end of the rampart, opposite the entrance in the main outwork. 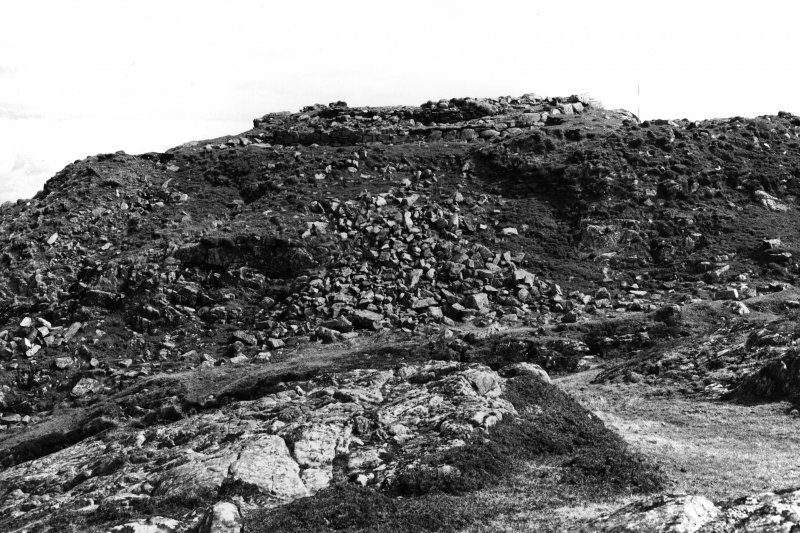 An isolated length of walling (c) which was constructed on the edge of a natural rocky terrace beyond the outer wall on the W side of the knoll, was thought to have served as the revetment of a beacon-stance contemporary with the primary phase of the broch. In a secondary phase a paved and kerbed rectangular hearth (h) was inserted in the middle of the interior immediately to the NW of the water-tank, which was now used as a refuse-pit. Beside the hearth were four whale-vertebra post-sockets, which could have supported a roasting-spit. At the same time the range of galleried timber buildings constructed against the inner wall-face appears to have been dismantled. 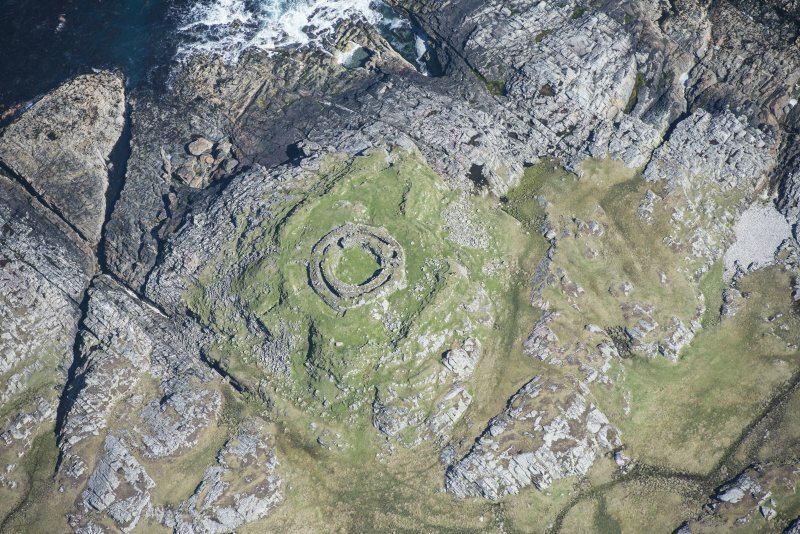 Such alterations suggested that the broch was no longer used as a communal refuge but had become instead the permanent residence of a single family, although its defensive strength was undiminished. Before long, however, the upper storeys of the broch wall were demolished, and some of the material was used to construct a round house within the interior, the rest probably being employed in the repair of the outer defences. 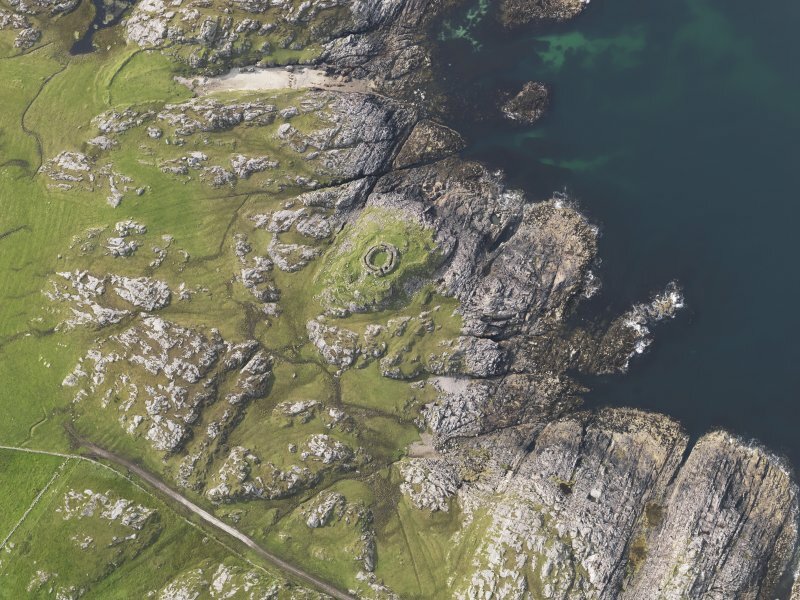 The round house may conceivably have been an aisled wheel-house, whose roof was supported by free-standing radial piers, but its fabris was very poorly preserved, perhaps as a result of deliberate destruction, and a definite identification was impossible. 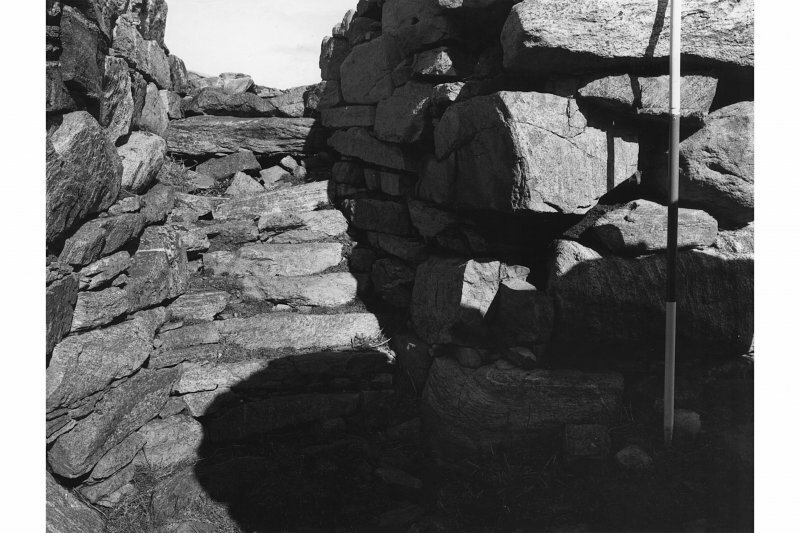 Its construction entailed the addition to the broch structure of an internal skin of walling, 0.7m in average thickness, which sealed off all the openings in the original inner face apart from the main entrance and the doorway leading to the mural staircase. The alterations to the outer wall apparently included the blocking of the entrance on the S, together with the addition of a capping of rubble and, where necessary, the repair of the inner face. During this domestic phase the site seems to have been occupied by a flourishing community, which was engaged in mixed farming and was also capable of working bronze and iron. This is the most probable context for the construction of the minor stone-founded dwellings in the area between the broch and the outer wall. Two examples of these (1 and 2), on the S and NE respectively, were examined during the excavation, and there are traces of what may have been a third (3) on the SE; however, as the latter appears to have encroached upon the line of the outwork's inner face, it may be later than the others. This phase was followed by a period of only sporadic occupation before the final dilapidation of the broch and its outworks began. Although the precise length of the successive phases of occupation is uncertain, the evidence of the associated artefacts and the radiocarbon assay of organic remains combine to indicate that the site was inhabited, although not continuously, from the late sixth or fifth century BC to the second or third century AD. In the earliest phase, for which radiocarbon dates of 445 +/- 90 bc and 400 +/- 110 bc were obtained, the pottery in use consisted almost entirely of locally-made vases or barrel-shaped urns bearing incised decoration, although there was one example of an urn of grittier fabric, which betrayed affinities with vessels more commonly found in associa tion with timber-laced forts. In the second pre-broch phase both wares continued in use, som e of the vessels being decorated with impressions of projecting ring-headed pins; the large quantities of animal bones found in this level produced a radiocarbon date of 280 +/- 100 bc. The construction of the broch, which occurred some considerable time after the end of the preceding phase, was dated by radiocarbon assay to ad 60 +/- 90, and the date of charcoal from the rubble layer which filled the intramural gallery on the abandonment of the round house was estimated by the same means to be ad 160 +/- 90. The latest datable artefact from the interior of the broch was the fragment of a Roman glass bowl made in the Rhine land between AD 160 and 250, and further fragments of Roman glass, of samian and coarse-ware vessels of first-and second-century date were discovered both inside the broch and elsewhere on the summit of the knoll. It is therefore unlikely that permanent occupation of the site extended beyond the middle of the third century A D, although purely domestic use of the broch may not have commenced earlier than the end of the second century. Of all the artefacts associated with either the broch or the wheel-house by far the most numerous and informative are the sherds of native pottery. These comprise further instances of the local native wares used in earlier phases as well as examples of pottery types which clearly belonged to an intrusive element in the population, presumably those responsible for the building of the broch. 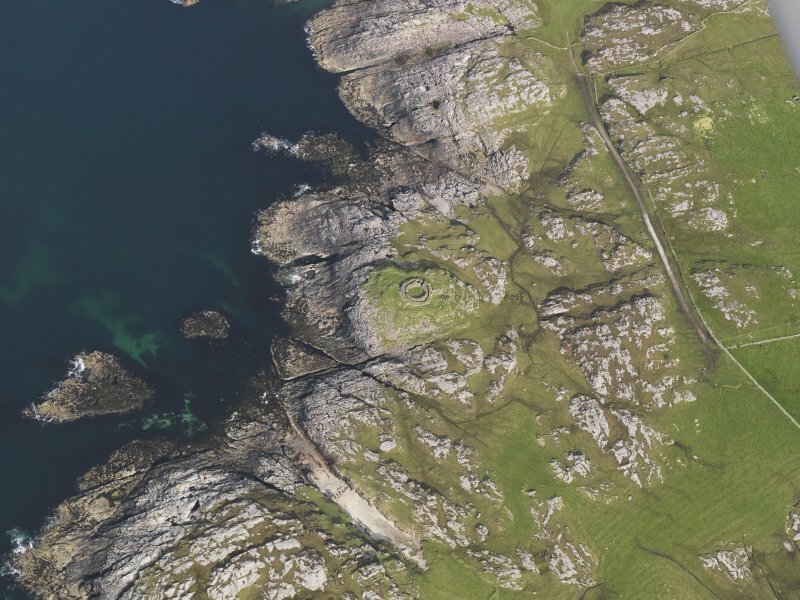 Vessels of the new ceramic tradition, which have everted rims and exhibit a variety of decorative features, were also found in construction levels beneath the primary broch floor, probably indicating that the immigrants had settled in Tiree some time before the need for a fortified communal refuge arose. Other finds include bronze and silver spiral finger-rings, rotary querns, quartzite strike-lights, glass ring-beads, tools and dice of bone, and several items of equipment used in weaving and the working of metals - all of which are objects commonly found in fortifed and domestic structures of the Later Iron Age in the Atlantic Province of Scotland. A single-edged composite bone comb, probably of early Norse date, was found in a part of the intramural gallery which appeared to have remained intact and lintelled long after the rest of the structure had become choked with debris. The only evidence apart from this for activity on or near the site during the period of Norse colonisation was the disarticulated skeleton of an adult male, buried some time after an apparently violent death in the interior of the broch. Part of a second human skeleton had subsequently been deposited in the SW sector of the gallery, but it was impossible to determine the precise date of the interment, and there were indications that it might have occurred in relatively recent times. 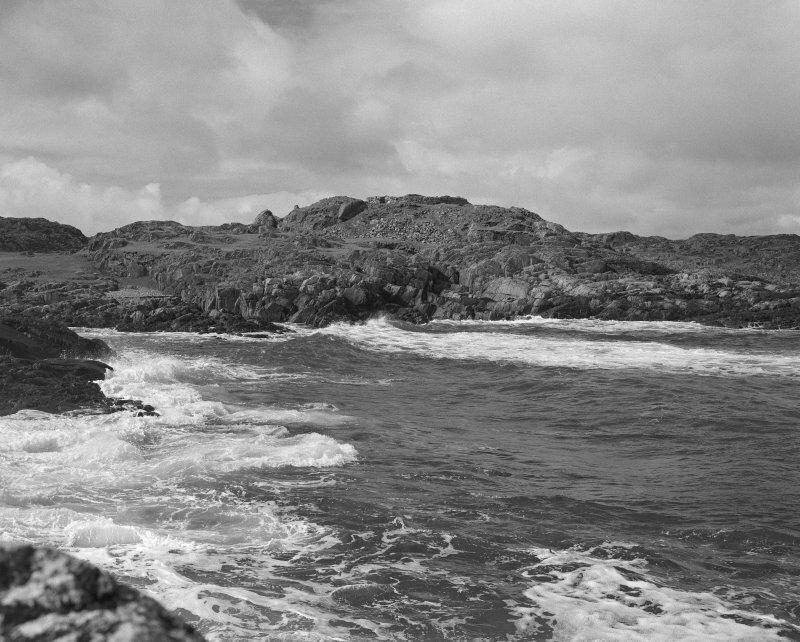 RCAHMS 1980, visited 1974; E Beveridge 1903; E W MacKie 1974 and 1975; Proc Soc Antiq Scot 1974; D MacKinnon 1973. Visited by OS (R D) 23 June 1972. 19. Hunterian.A.1966.118 Solid bone. Badly damaged. Faces have 3, 4, 4 and 2 dots respectively. All dots enclosed by two concentric circles. 32 x 22mm (present dimensions). 20. Hunterian.A.1966.119. ?Solid bone. Fragment. Faces have 4, 5 and 2 dots respectively. Two concentric circles enclose all dots except two which are enclosed by single circles. 36 x 16mm (present dimensions). Both from an unexcavated part of the site. D V Clarke 1970; E W MacKie 1971. 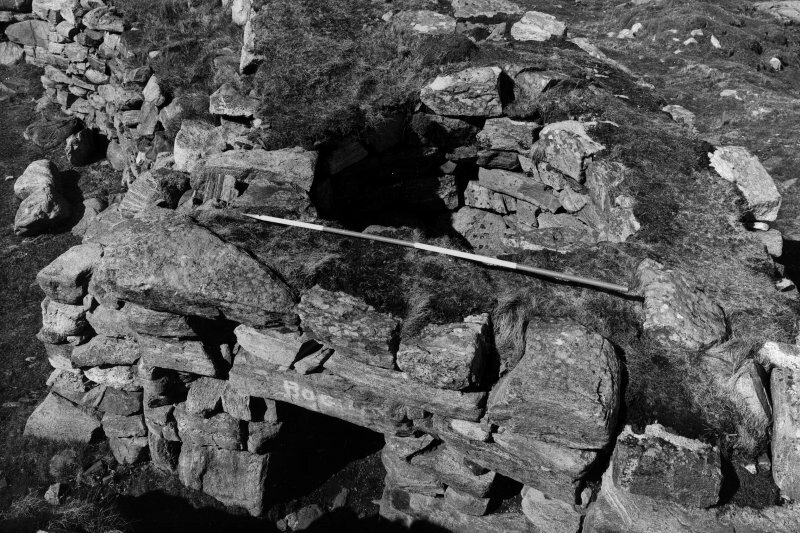 This well-preserved broch, situated on a rocky knoll close to the shore, was excavated between 1962 and 1964, and we thus have detailed information about the sequence of construction and the objects discovered in the various levels. 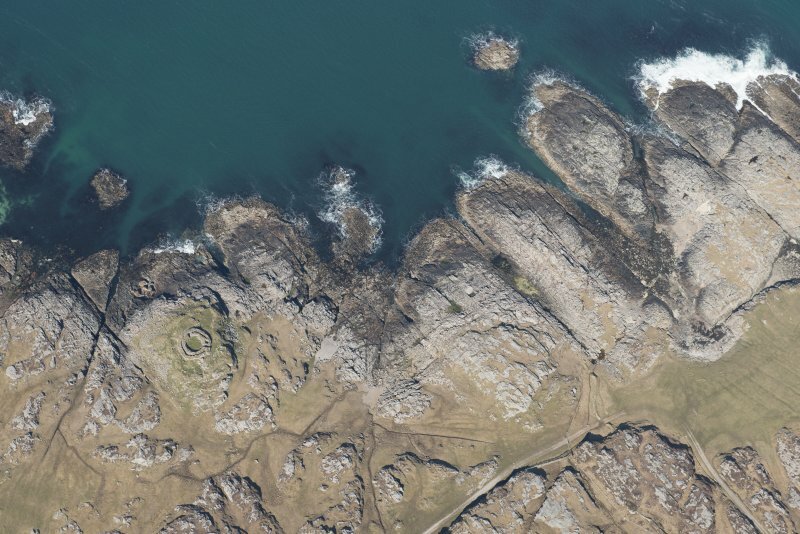 Set within an irregular but stoutly made outwork, it illustrates many of the features of broch-building including a basal gallery, scarcement ledge and guard cell. 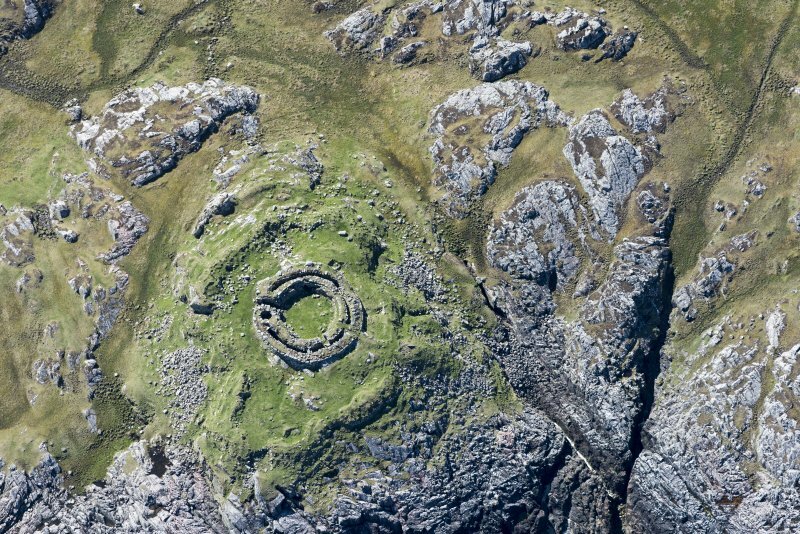 The broch measures about 9.2m in diameter within a wall up to 4.5m in thickness and surviving to a height of 2.2m. Within the thickness of the wall there is a gallery; the main entrance to this was on the NNW side of the interior where there is a doorway, which also opens onto a stairway to the upper levels of the broch. Two smaller doorways still lintelled by massive slabs provide additional access from the central court into the gallery. 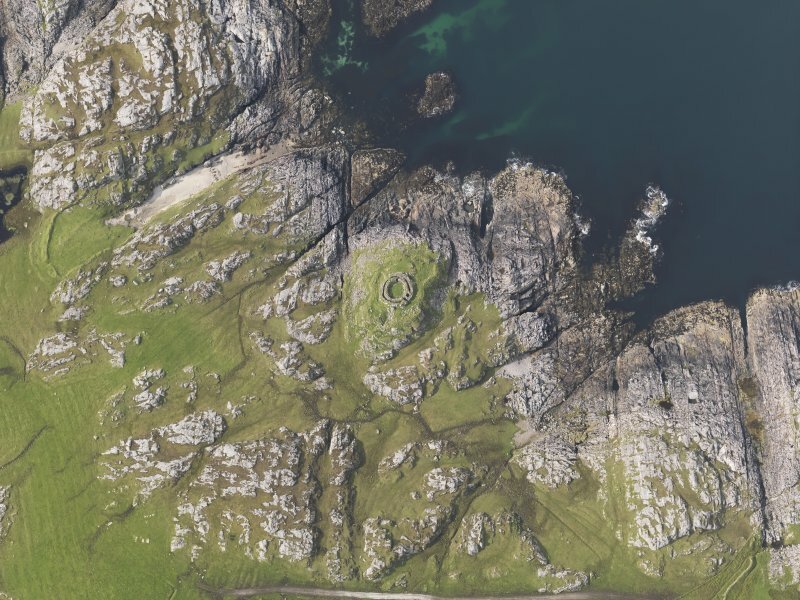 Originally the gallery would have been lintelled, and the broch would have been several metres taller (perhaps as much as 8m in all), though there is no reason to think that it would necessarily have reached the heights of Dun Telve, Glenelg (10m) or Mousa in Shetland (13.3m). 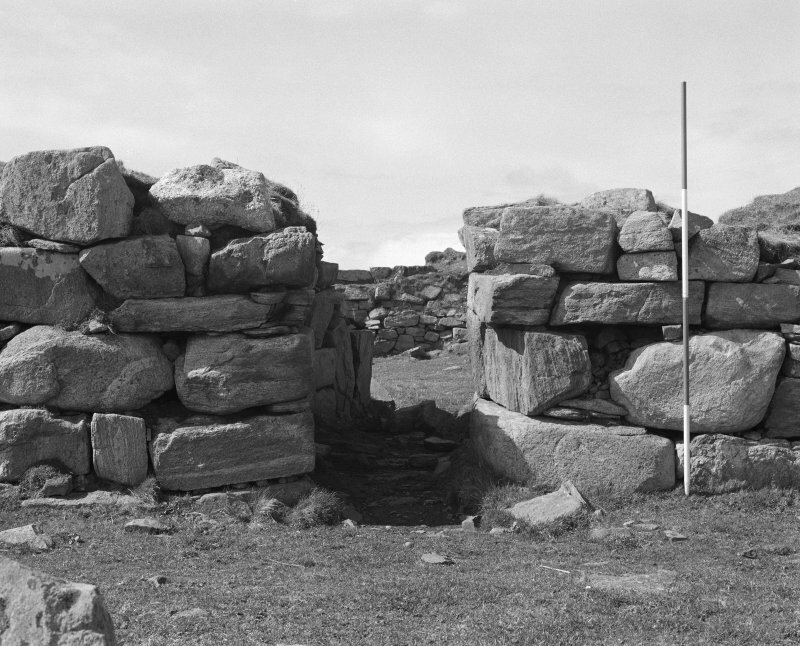 The entrance is on the ESE side of the broch; it has checks against which a strong wooden door would rest, the door itself swinging on a pivot-stone still visible in the floor of the passage on the south side. The door could be held in a closed position by a thick wooden bar which was kept in place in twin bar-holes. There is a guard cell on the north side of the passage, the low lintelled doorway leading to a corbelled cell measuring about 2m in diameter. The interior of the broch would probably have held a range of timber buildings supported by upright posts and by horizontal members, which rested against the scarcement ledge visible on the inner face of the wall at a height of about 1.4m. In a secondary phase the internal arrangements of the broch were radically altered and non-defensive occupation has been envisaged, with the broch walls lowered in height and some of the stone used to provide an additional internal line of walling, which seals off two of the three entrances into the mural gallery. The original building of the broch probably dates to about the middle of the first century BC with its reconstruction as a non-defensive round-house perhaps about AD 200; the ruins of the broch tower remained the focus for intermittent settlement or shelter in the following centuries, including the Viking Age as is proved by the discovery of a composite bone comb of Norse type. The finds are displayed in the Hunterian Museum, University of Glasgow.